The term Brotherhood of the Rope is not a new one in mountaineering and climbing circles; it refers to the interdependence inherent amongst members of a climbing team, their reliance upon one another for safety, security, and success. It is also the title of the biography of famed American climber Charles Houston, whose team's failed 1953 attempt on K2 in Pakistan - the world's second highest peak - remains one of the greatest stories of the Brotherhood of the Rope. ...men banded together in a common effort of will and strength--not against this or that imagined foeman of the instant, but against their only true enemies: inertia, cowardice, greed, ignorance, and all weaknesses of the spirit. Sadly, this amazing brotherhood of the rope, this banding together of teammates "in a common effort of will and strength" seems to have dissipated in the current climate on Mount Everest. We saw it last spring in the controversial death of David Sharp, but were inspired only days later at its rebirth with the successful rescue of Lincoln Hall. The question of why people did not help David Sharp last spring is full of gray area: the realities of altitude, sickness, team objectives, etc. undoubtedly weighed heavily on decisions that day. But, what is obvious to me is that the tradition of the brotherhood of the rope has diminished in modern climbing. I've been on countless rescues, son, and can tell you your efforts are useless. These men will die. You'll have to get used to it. Well, despite that climber's opinions to the contrary, the two Chinese glaciologists survived their ordeal. I ruined my knee - and the rest of my expedition - in the process, but never gave it a second thought. Simply put, no mountain is worth sacrificing our humanity. In countless other rescues in the high peaks - Nevado Huascaran in 1998, Everest 1999, Everest 2001, Everest 2002, Everest 2003, Rainier, McKinley...the list goes on - I have always valued the brotherhood of the rope. 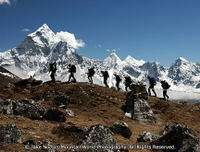 Our goal on a mountain is the climb, to finish the route, to reach the summit. [The Brotherhood of the Rope] is our willingness as leaders to recognize and assist others --- having a wide angle view rather than blinders only for results or personal peak performance. Even in the absence of mutual gains, even without indirect advantages to offset tangible costs, some decisions require a transcending of self-interest, whether personal or organizational. We can all ask ourselves what our Brotherhood of the Rope is. Will they be there for you when you fall? Will you be there for them? What are your goals, and when are you willing to sacrifice them to keep the brotherhood alive? This was a powreful post about brotherhood with stories, values, and perspective. Take care and carry on caring. I often look at all the strands that are inside a climbing rope and recognize the strength of the rope is based on the strands being together. Thanks for your comment, and glad you enjoyed the brotherhood piece. Excellent point about a rope not being a single strand, but rather many strands - many of which are unseen and unnoticed - which bind the whole together. Something for all of us to remember! Likewise, take care and keep on caring.